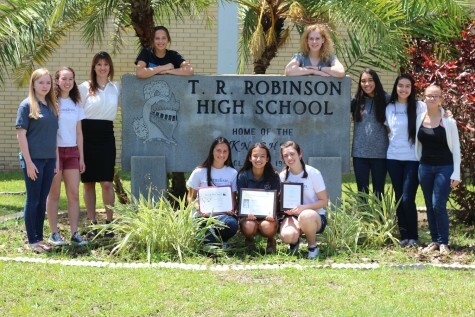 RHStoday is the student run news site of Robinson High School in Tampa, Fla. and serves the 1,543 students of Robinson, its staff and the surrounding community. RHStoday strives to publish daily every day of the school year, excluding days off of school, non-student days and semester exams (Jan 11-15 and June 6-10). RHStoday uses the SNO (School Newspapers Online) content management system. The staff meets as a class every day or every other day depending on a student’s grade and scheduling conflicts with other classes. Our adviser, Nancy Oben, also advises Robinson’s yearbook (Excalibur), newspaper (KnightWriters) and TV production classes. RHStoday aims to publish news that is relevant to the school and the surrounding community. The staff with their 2015 Pacemaker awards. Our school colors are black, silver, grey and white, accounting for our black background. Our accent color Cerulean (15-4020) was chosen from a list of Pantone’s colors of the year. Blue represents trust, dependability and strength, all things we strive to achieve as a news organization. Contact us at [email protected] with any questions, comments or concerns, or click here.